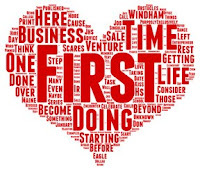 Starting a business and becoming an entrepreneur (for the first time) is not about taking one step at a time, it's about getting beyond the firsts - maybe many first or even a series of first (purposly left singular). 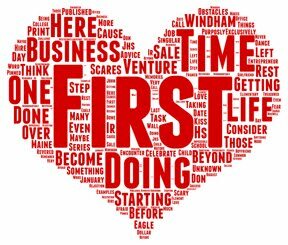 The advice here is when you encounter a first, don't consider the task, consider it as a first - you have done 100s of firsts before. Think about what scares us in life - it's not the doing of something over and over, it's about doing those things for the first time. But those firsts are more than scary, they also become our most revered and treasured memories. Think about it - Here are some examples of our firsts. What's common here? It's the word first. When we are afraid or scared, it's because it's your first time. It is not about being insurmountable or impossible - it's just that we have never done it ir been there before. Remember, your first time at anything has an unknown element to it - the unknowns, by their very nature, at a minimum, cause us hesitation - at the most, cause us fear. Any venture, any opportunity, any challenge, and much of life is about doing, and getting beyond, your firsts. We celebrate firsts. We reminisce of firsts.